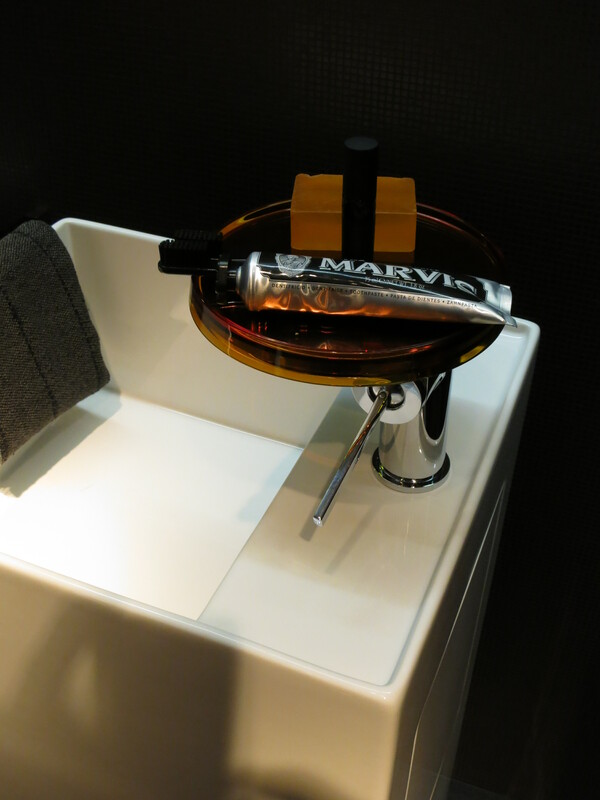 Continuing my report from ISH 2013, the Bathroom Experience show in Frankfurt, I’ll focus on fixtures that caught my interest. 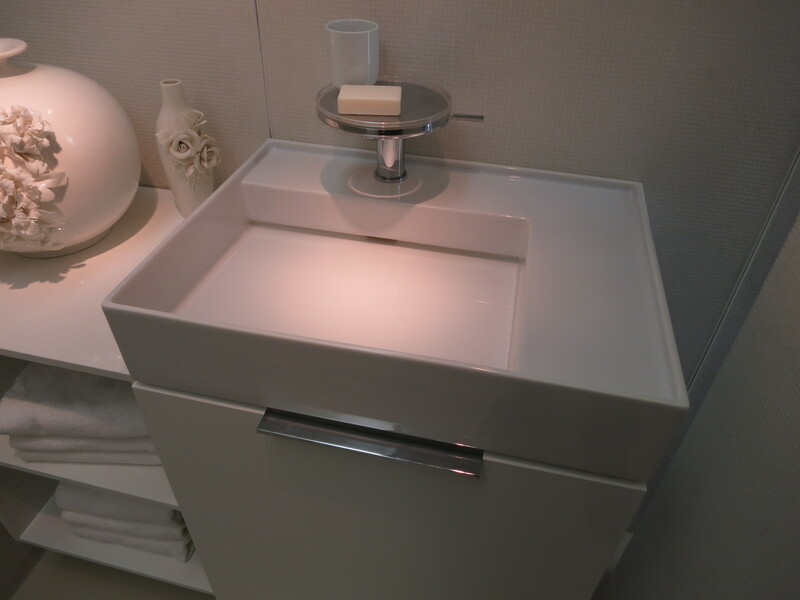 First up, some lavatory basins. 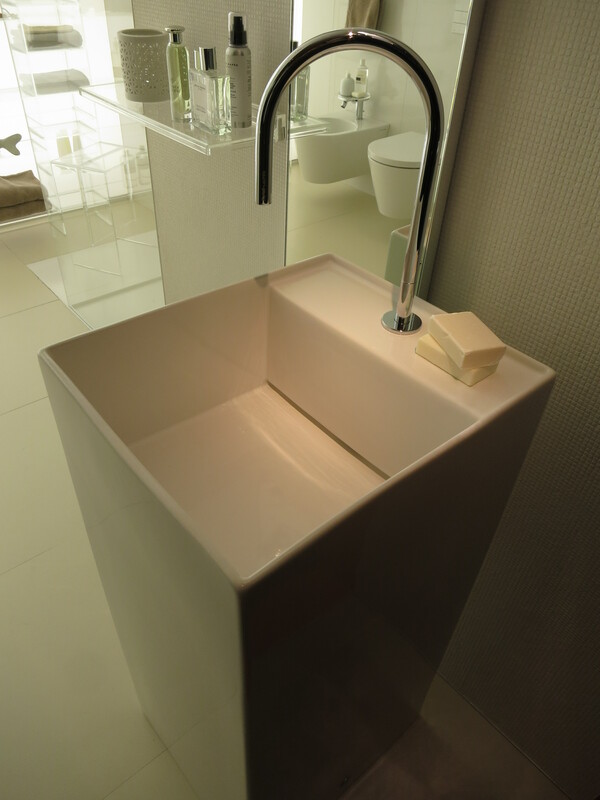 This is a free-standing design by Flaminia. I like the detail of the swirl. 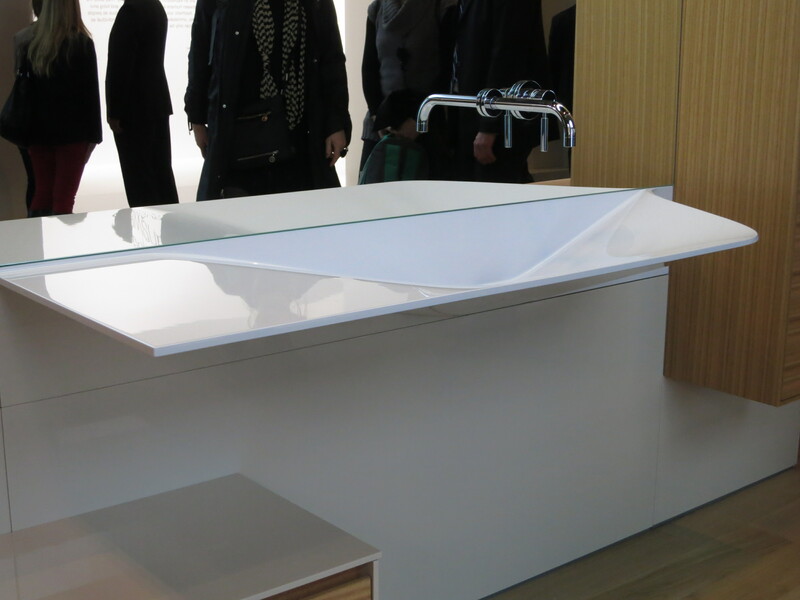 I’m not sure what type of material this was molded in (white matte Corian-like), but it was well done. 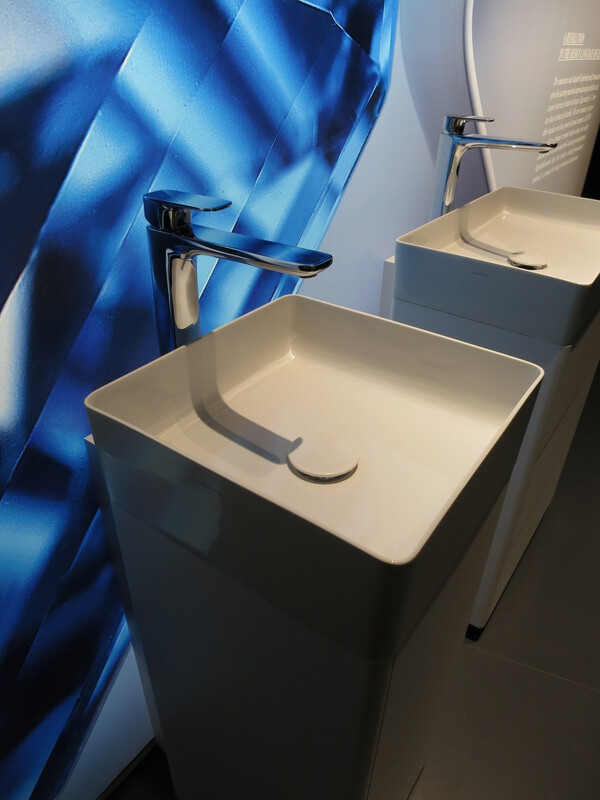 Laufen collaborated with Kartell for a collection which had plastic modular shelves and a faucet which had an integrated caddie-shelf. 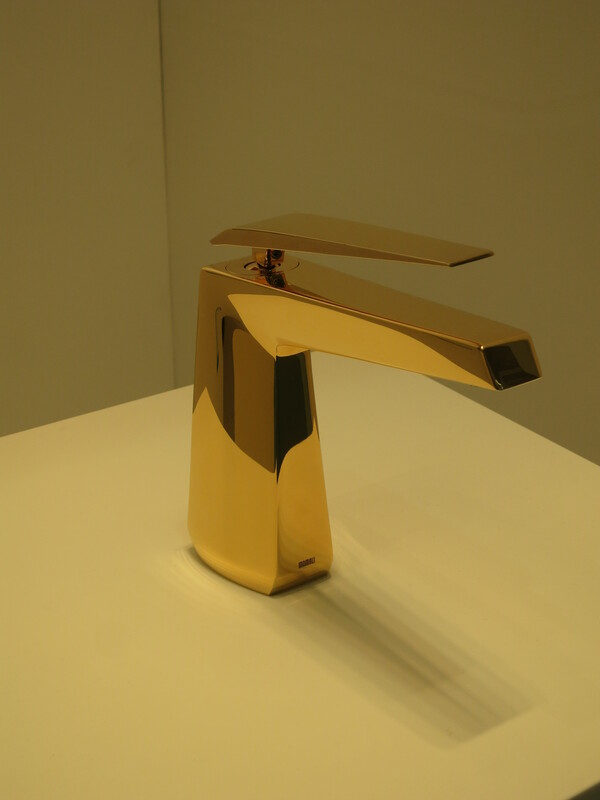 More on the faucet on my next installment (part 3) but here was the lavatory from this collection. A nice asymmetric shape, very cubic. 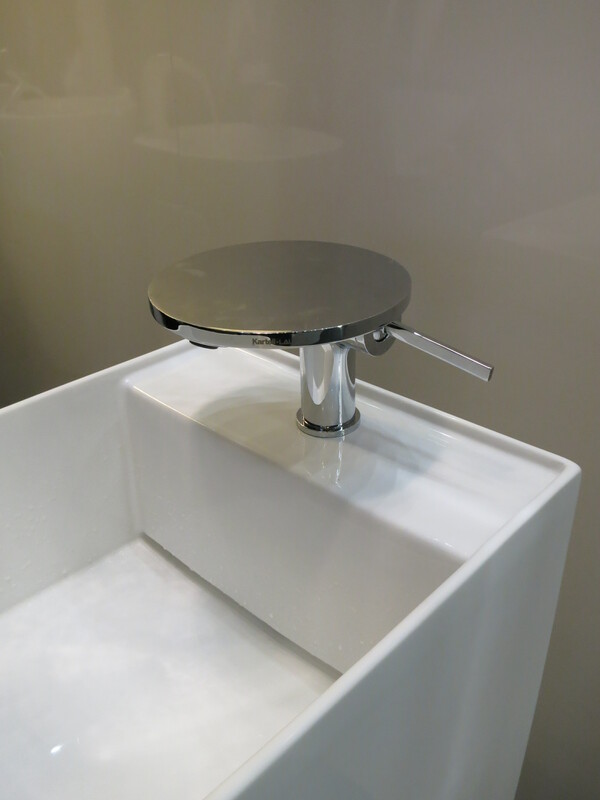 The faucet being very round and the lav being square… I thought this could have a bit more integration in concept but perhaps we’ll look at that criticism closer in the next installment. 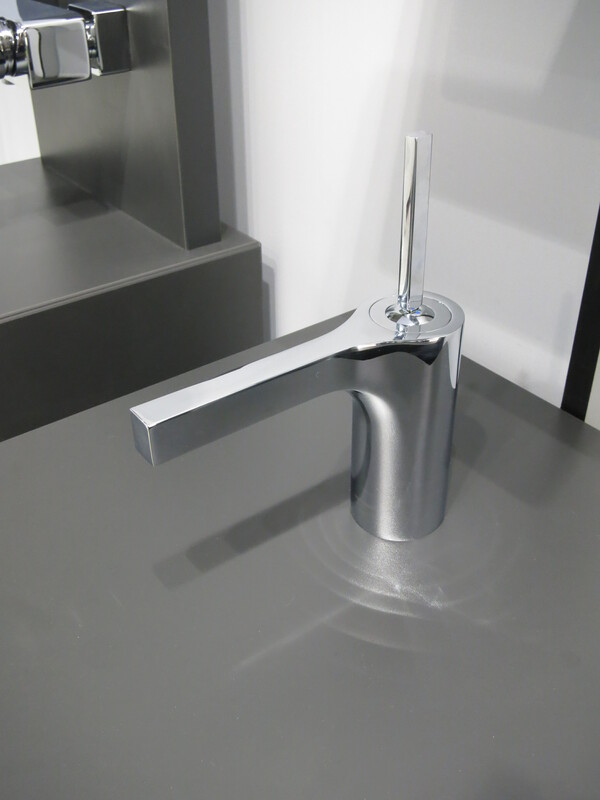 Here is another design from Laufen, this one I think in steel. I rapped the side and it made a tinny sound, so that is all I am going on. I love the thin edge at top. 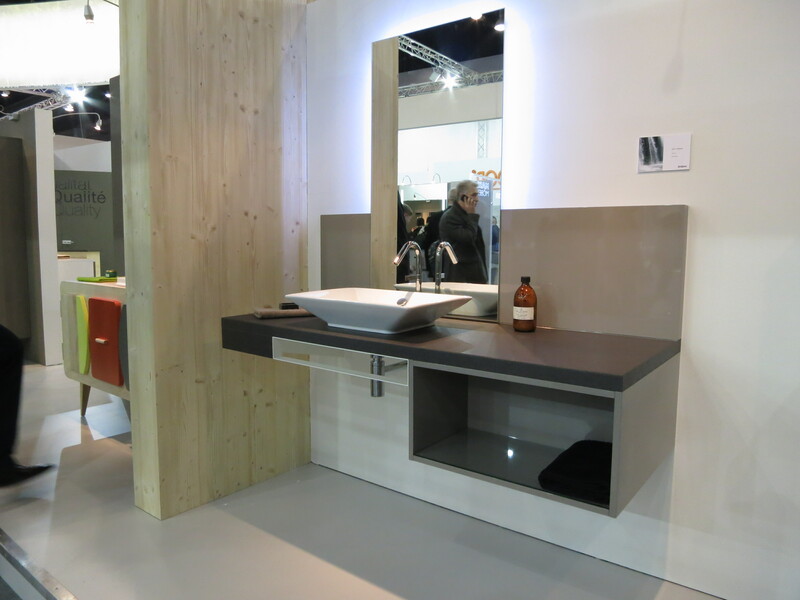 I like the basin display above. 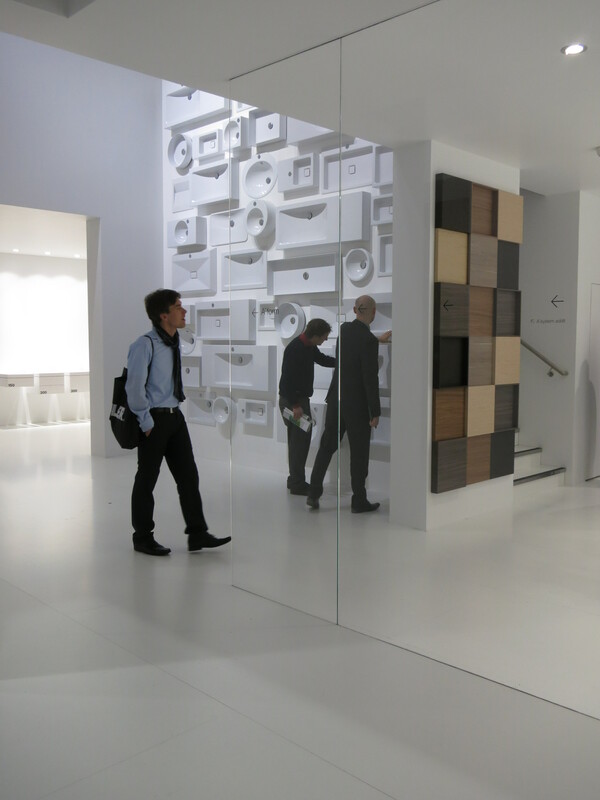 The selection of wood/laminates was on-trend and the quality and design solid if not exciting. 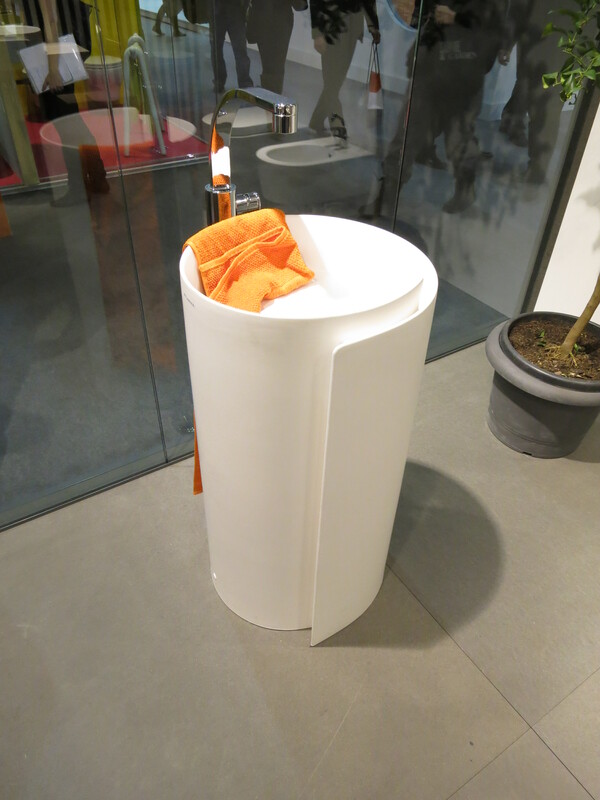 A free-standing lavatory from Zuchetti. 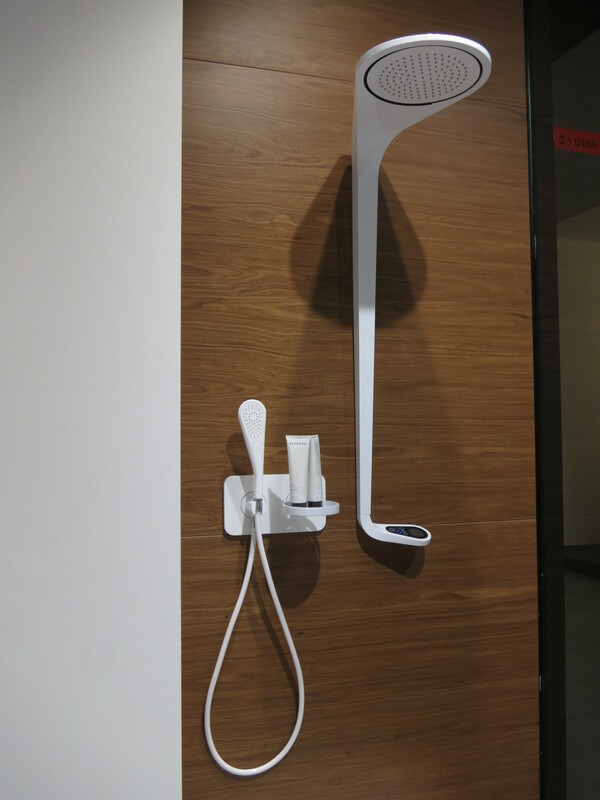 I love integrated towel bars and heightened functionality. I think we could take this further, showing where/how the soap is used. Come to think of it, having no flat surface here, this might be better for a powder room or a commercial (boutique-type) space? Not sure where this type of columnar lav works best. This is one of those stands I forgot to note the manufacturer’s name. This was a very nice, white matte finish lav with great proportions and scale. On to some baths. 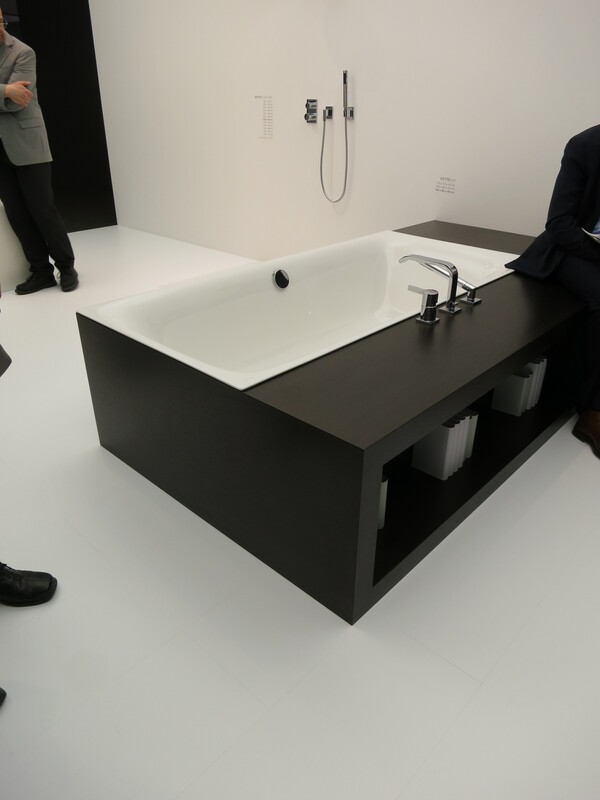 Duravit had a large stand, well-attended as usual. 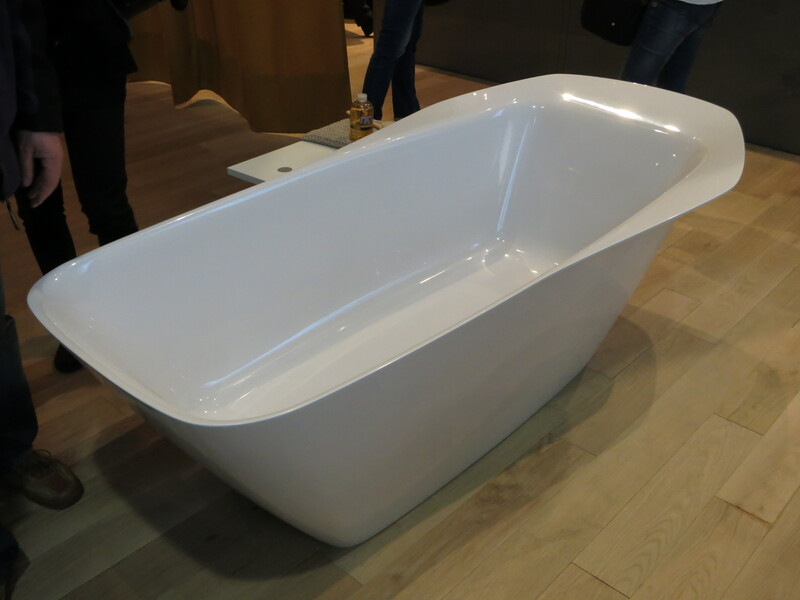 There were some new pieces by Stark and Sieger Design, but this simple bath caught my eye. I like the soft but elemental shape. This is from a company called Bette; this was very thin enameled steel. 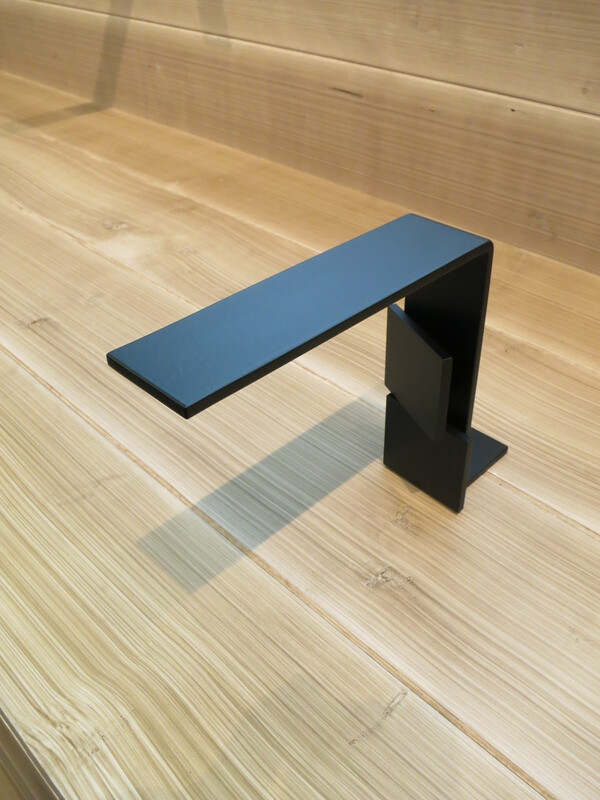 The edge of the fixture is flush to the edge of the millwork. Very nice detail. 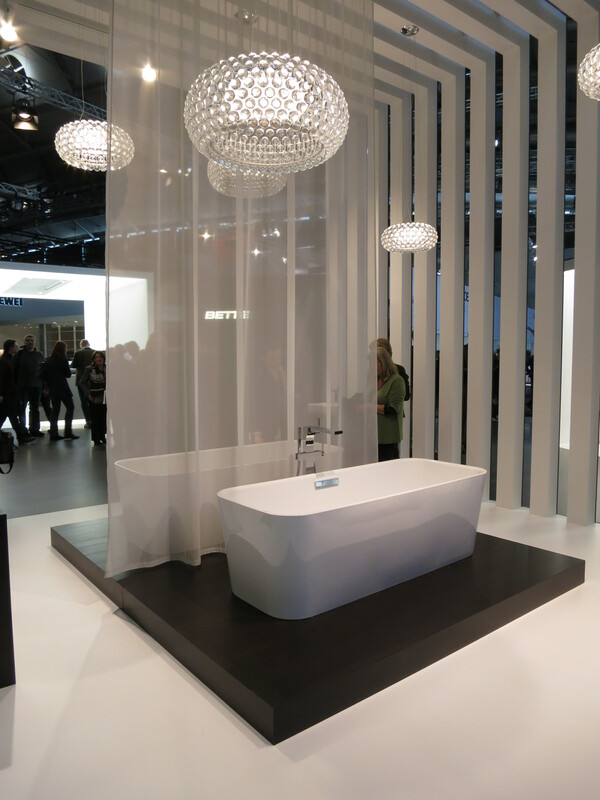 Vitra had a large display. Some of their product was displayed behind veils, and consequently, nobody was paying attention to it. 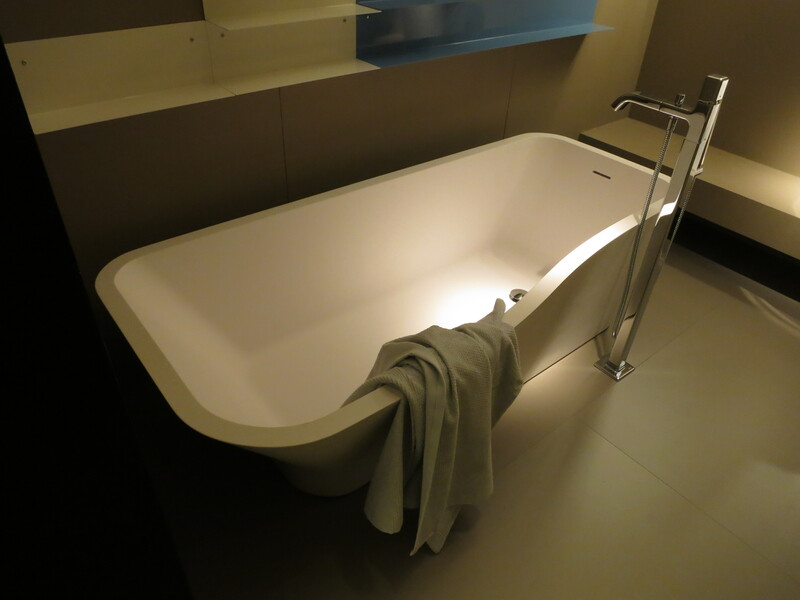 This was a very well-proportioned bath. Something from Burgbad. I like the “collar” design on the backrest. 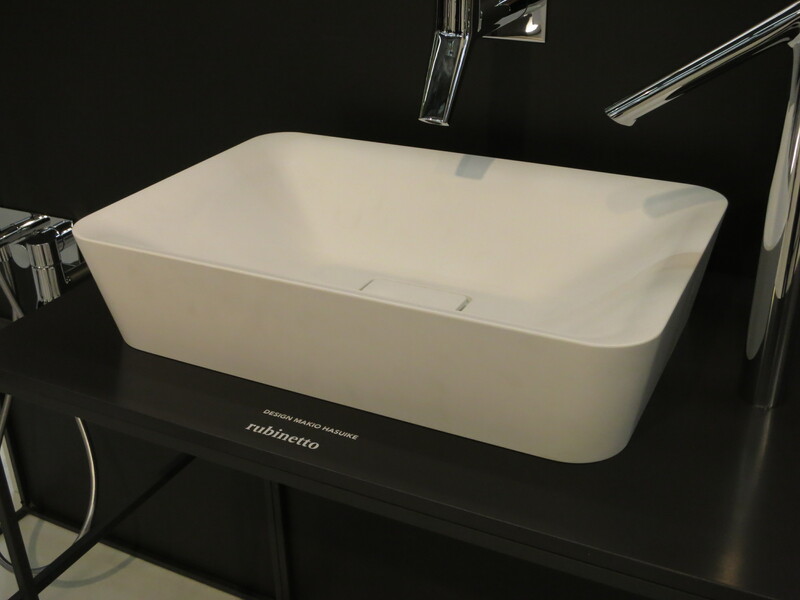 Another “collar” bath, this one by Laufen. 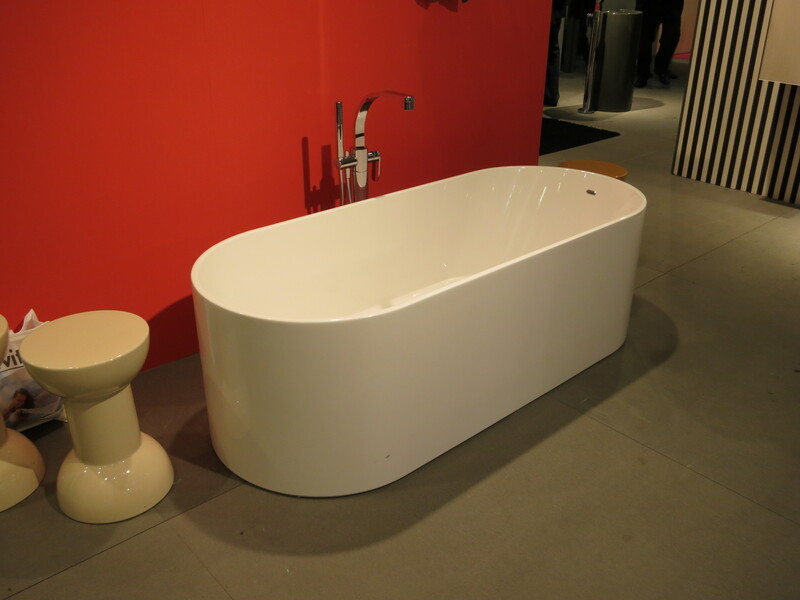 A very large bath by Antonio Lupi. One person would get lost in here. Invite a friend! 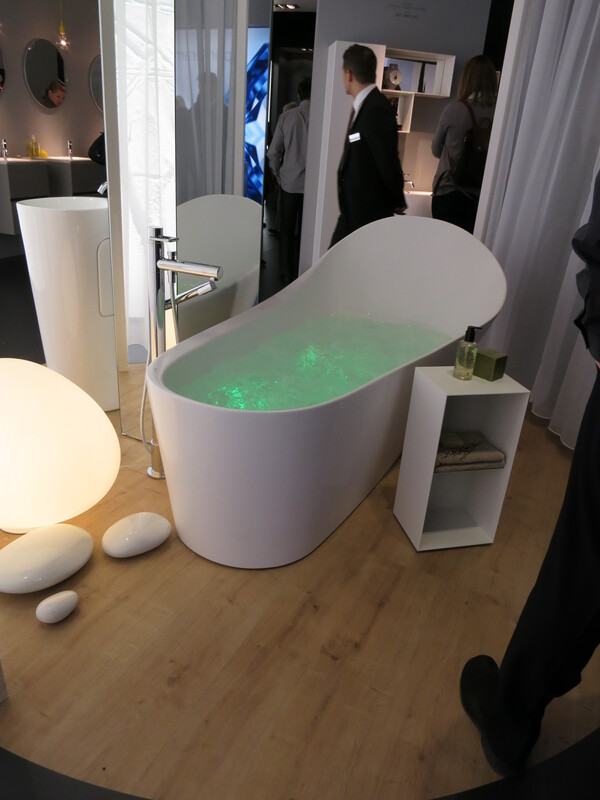 This was my favorite bath of the show. Faraway by Ludovica and Roberto Palomba for Zuchetti. This was released in 2009 but I have never seen it before. Love the shape, proportion, detail. The wide edge is seductive. Zuchetti is always a highlight for me. 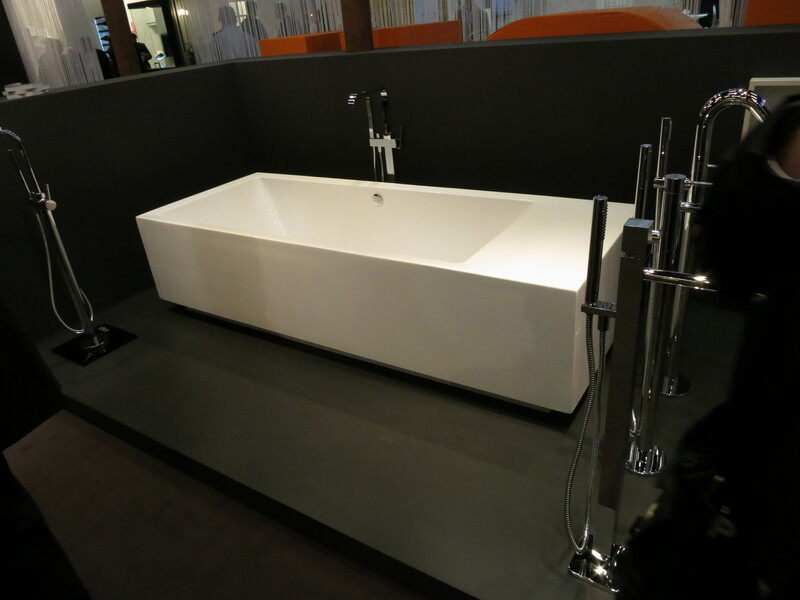 The last bath pic is actually first I took when entering the show. 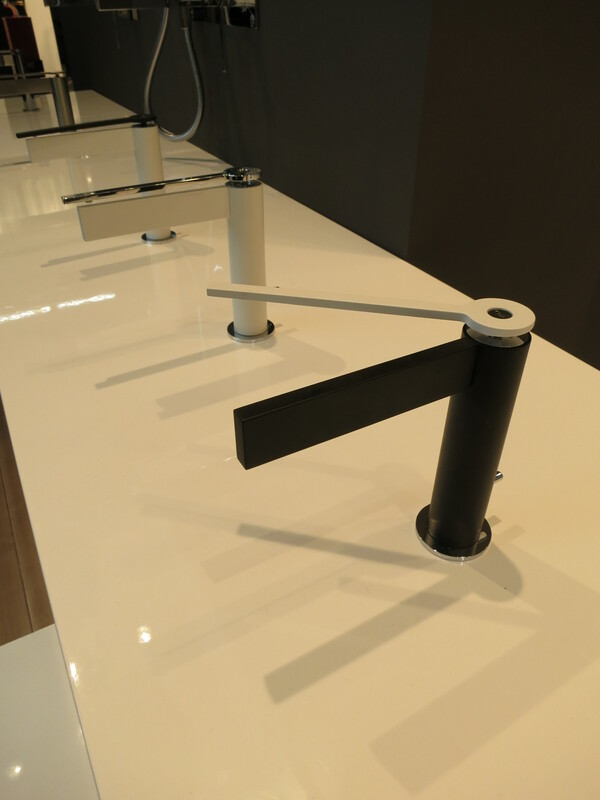 I love these sharp-edge Corian-type matte finish fixtures. The deck would be great for a small TV or candles, etc. The next round will show my faucet highlights. As I mentioned in the first installment, the scale of this years ISH was down a bit. 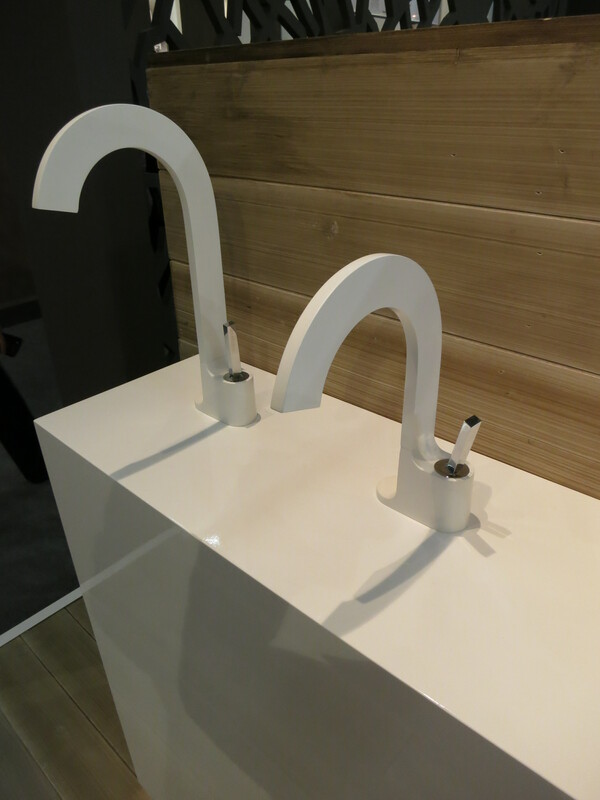 There were some nice innovations in faucets, however, and since I have been working on a faucet project I was keyed in pretty close to the trends on shape and finish. I saw some new designs which looked a lot like some things I have been working on, which is maybe not too surprising. Maybe I’ll show some of my sketches in comparison. 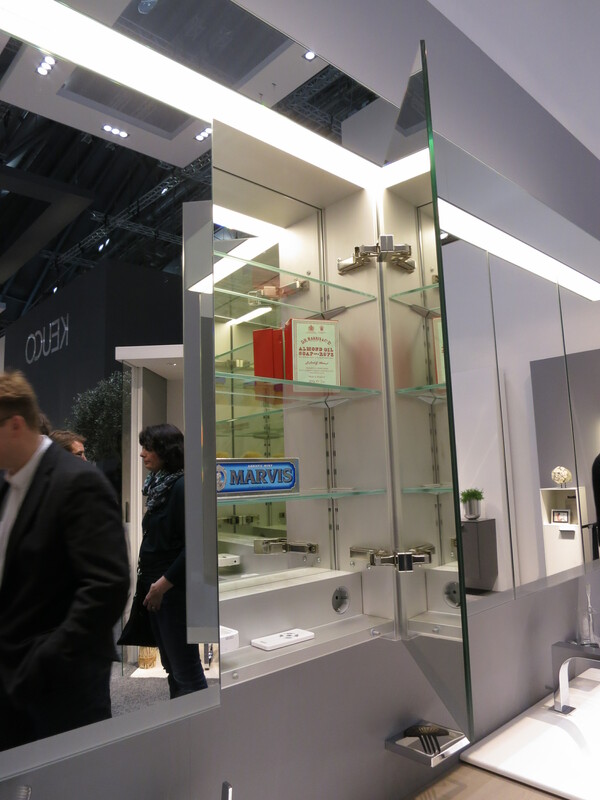 Just back from ISH in Frankfurt, Germany. I also used the short time in Germany to visit SieMatic to discuss our ongoing showroom projects around the world. A snowstorm in Frankfurt cut my trip short by one day so I had to shotgun the tour of the 5-hall bathroom show in one jet-lagged day. 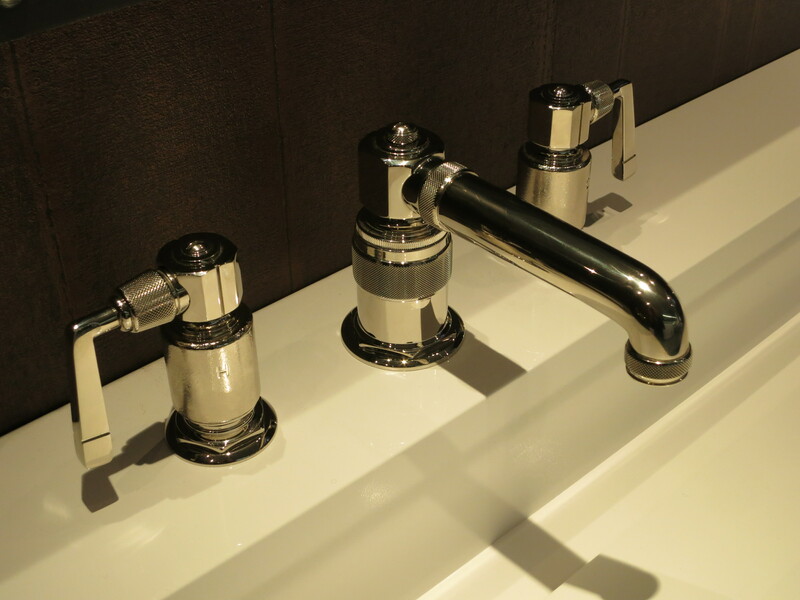 I was mainly concerned with faucets, vanity cabinet ensembles and baths; here are some quick highlights. 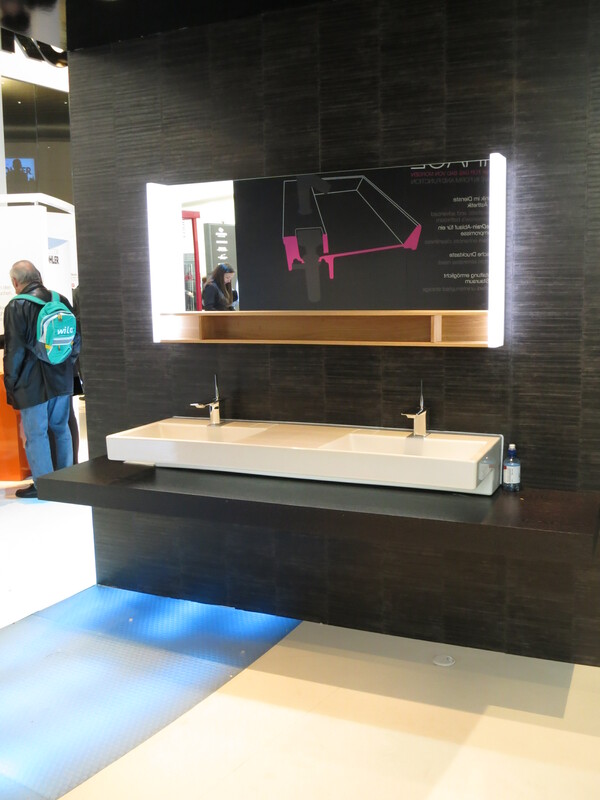 First up are some vanities by Sanijura, a French company located near Geneva in the eastern part of the country, owned by Kohler. I visited this factory and worked with the company years ago when working with Kohler in the Cabinet Division. It looks like they have come a long way and I was impressed with the design and workmanship. 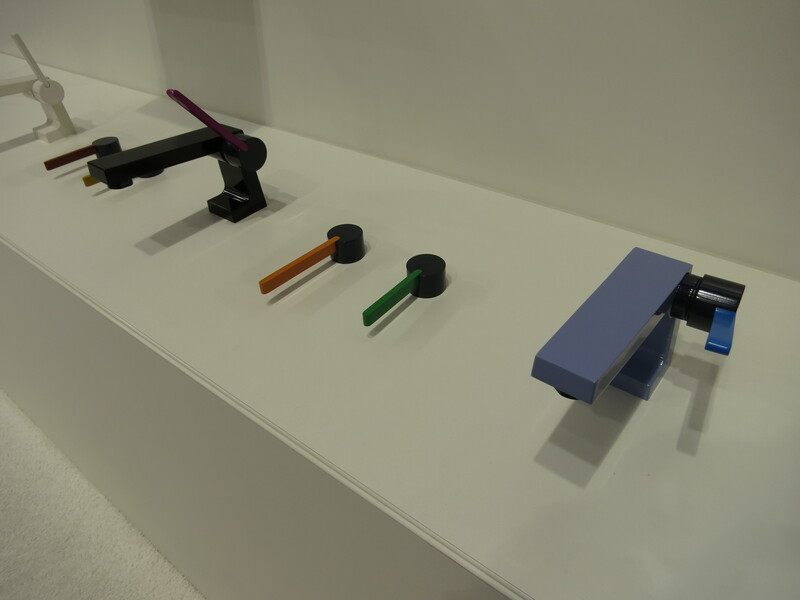 I like the integrated towel bar and the colorway is very fresh. This ensemble shows the ongoing trend of mismatched, randomized cabinet configurations. Next up was a company called Burgbad, from Germany. 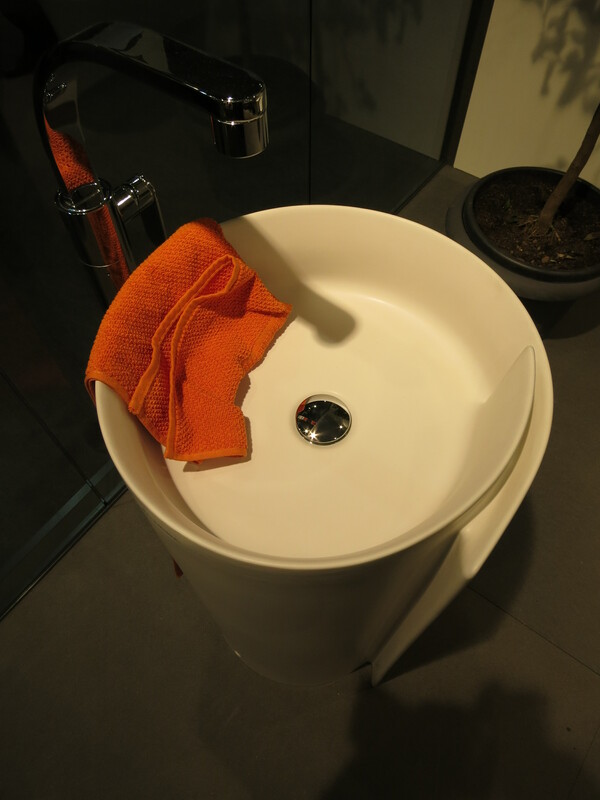 This lavatory basin is molded from some sort of acrylic, like it came from one sheet of material and was folded or pressed into shape. Very minimal and elegant, although I wish the wall color was more interesting or in more contrast. 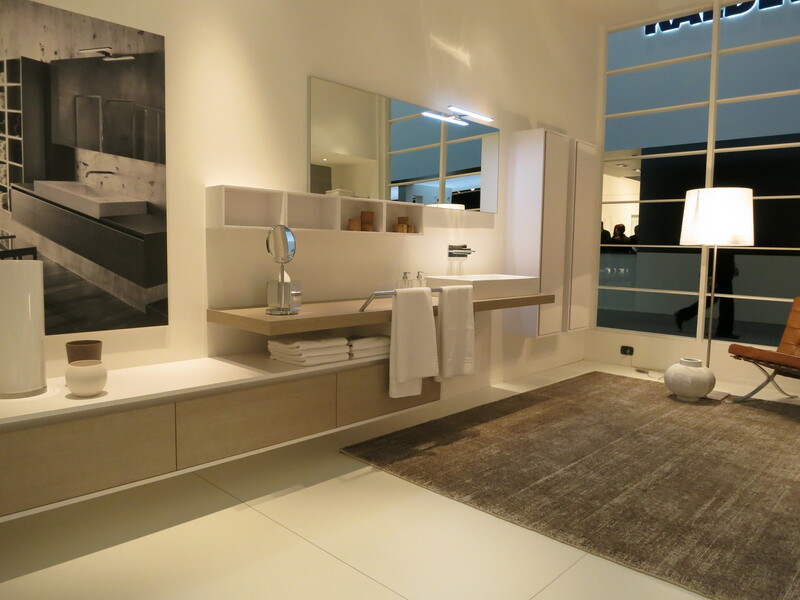 This all-in-one bathroom pavilion was clever, with the adjacent tall cabinets part of the composition. 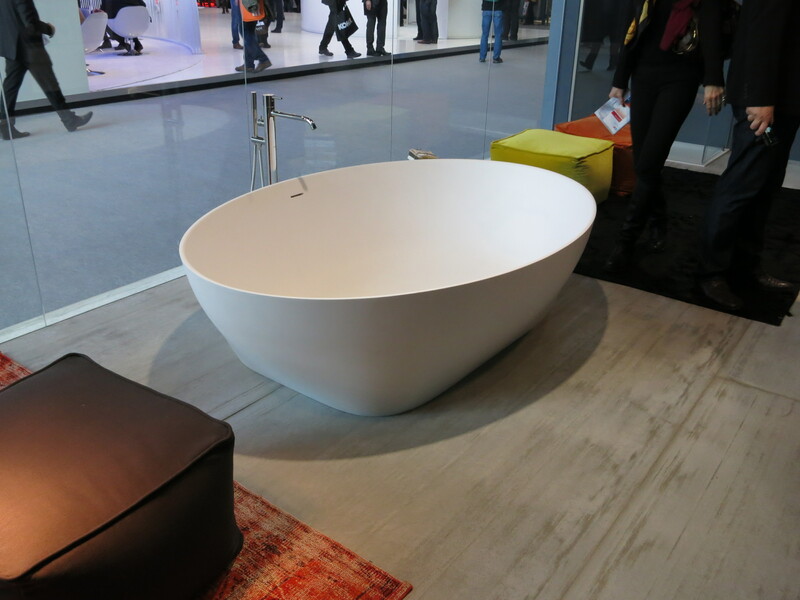 I like the integrated TV above the bath. 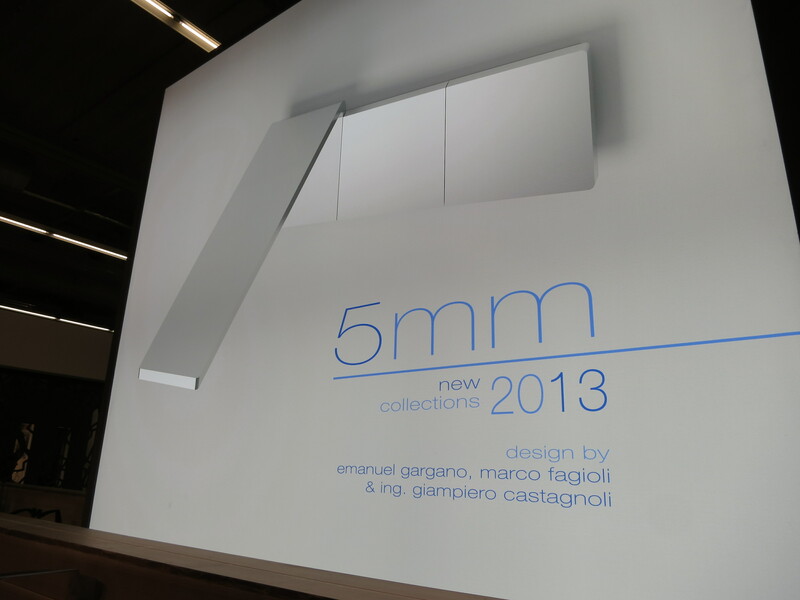 Supporting the tall cabinets and the other displays was a metal stud system that the company made visible on the backs. I should have asked about it – it looked very clever. I don’t know if it is something proprietary to the company or if it is some sophisticated European wall system. There was a name on it – Viega. I will have to search around for this system. 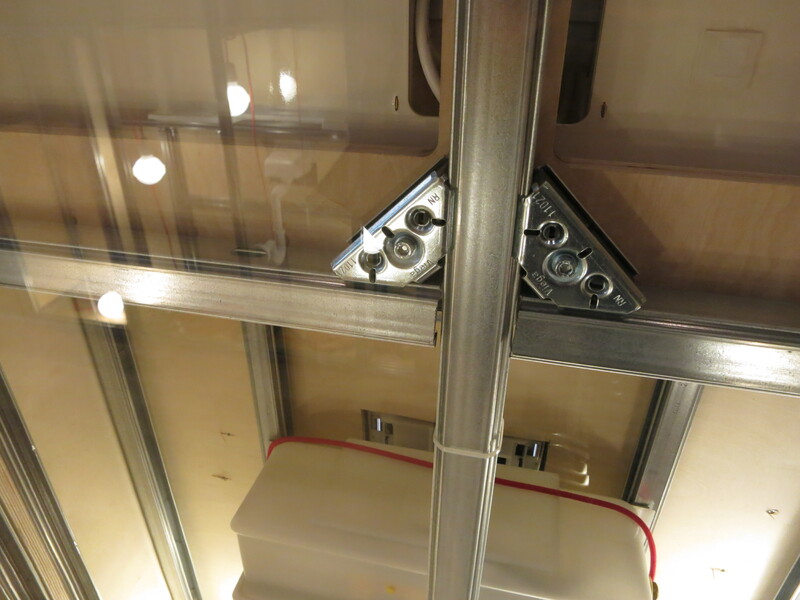 This next cabinet system was one of my favorite designs from the show. I forgot to note the company who made this! 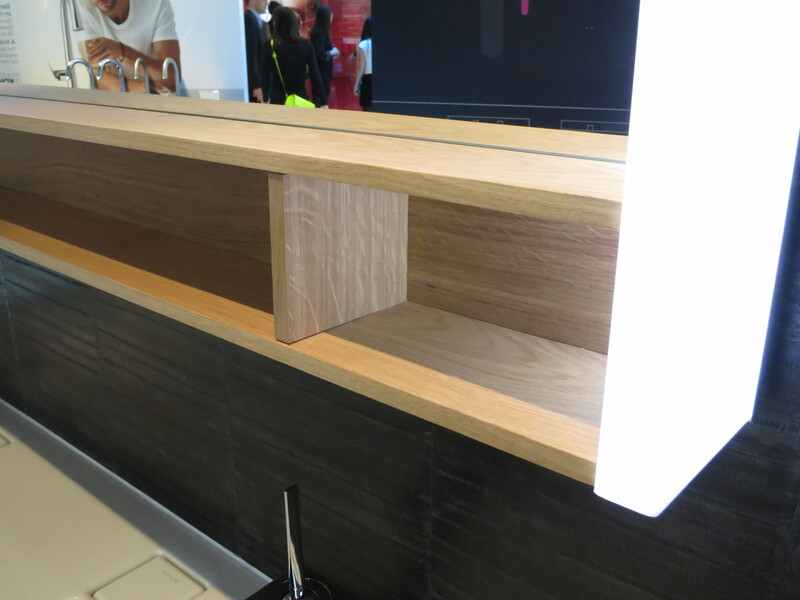 Anyway, the cabinets are made from laminate, but are lacquered on the fronts. The seam (see below) is quite good. This is an adventurous detail and it comes off quite good. 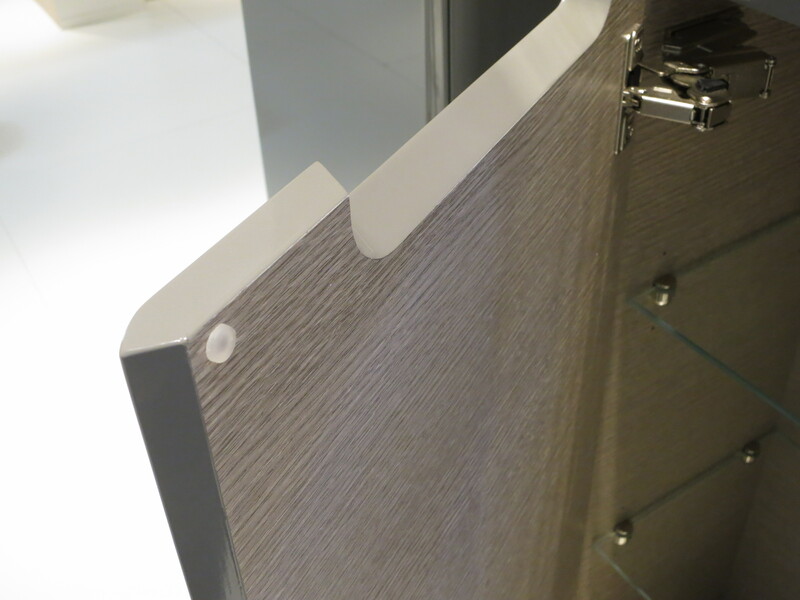 A very, very nice idea which eliminates the need for a separate radius edge side panel. 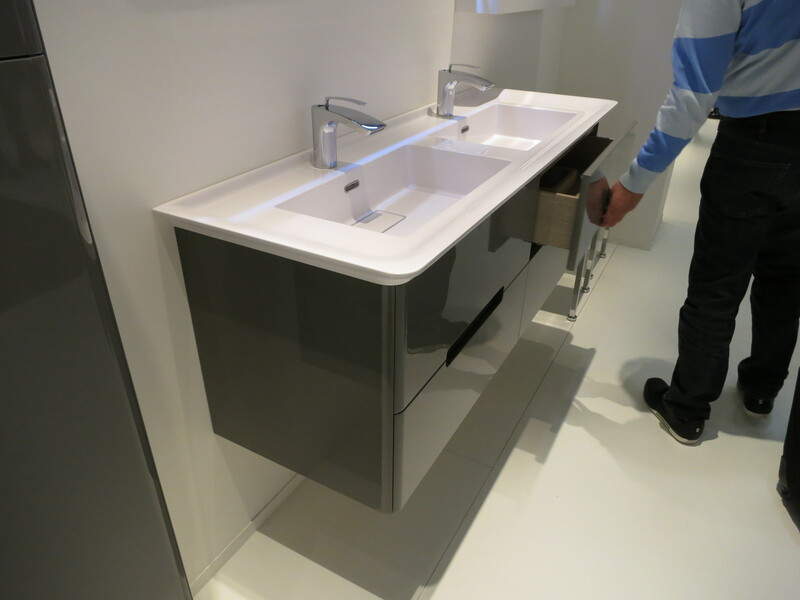 Next up, a nice vanity composition with a clever, angled towel bar integrated into the countertop. I didn’t get the name of this company either. 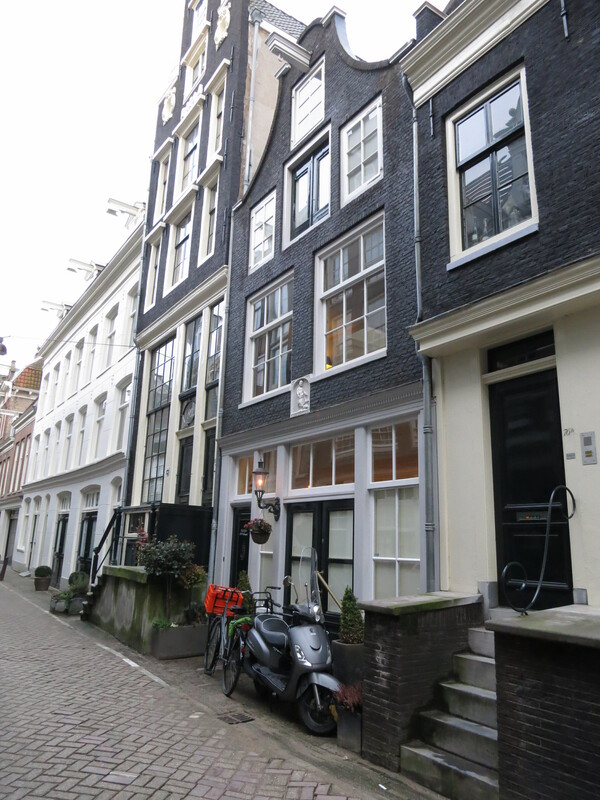 It is a very well-known maker but I just didn’t note it down – darned jet-lag! 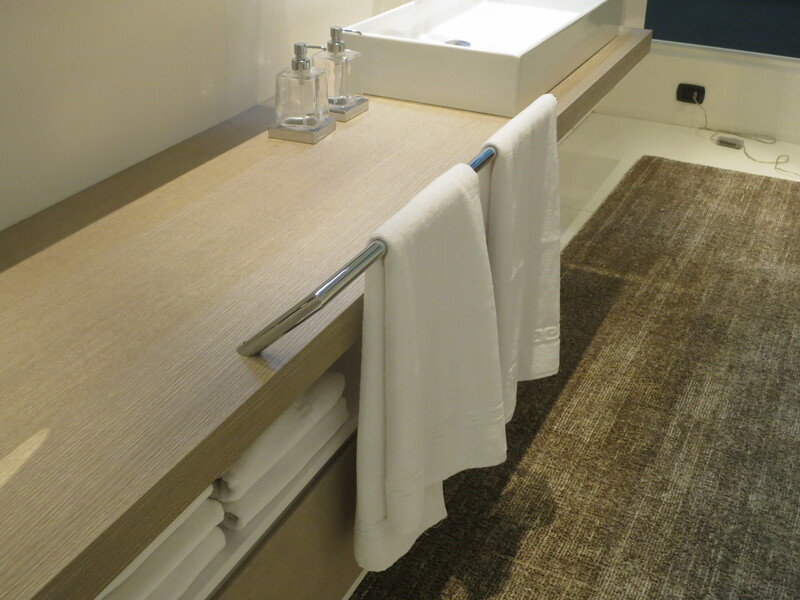 Detail of the towel bar. 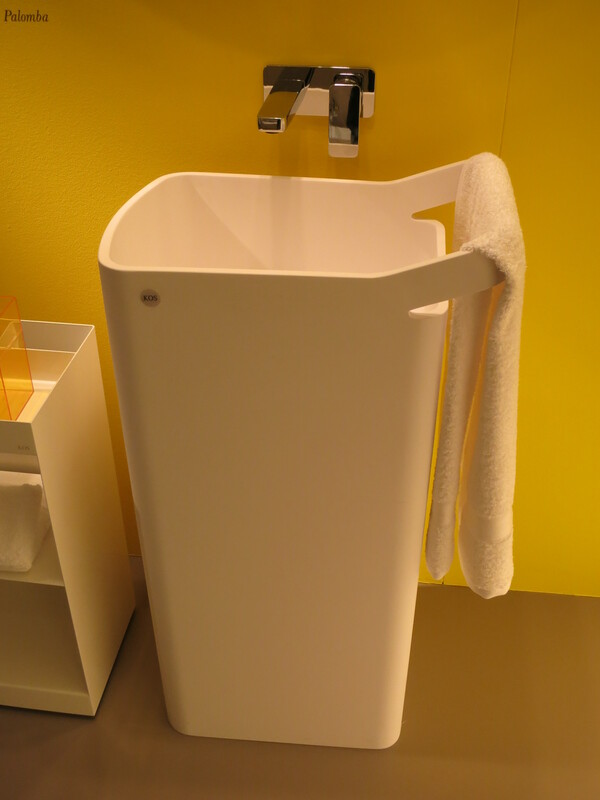 The Kohler stand was a little cold and without much style. I think they could use some brand differentiation. This wall was a little better – just a little color, anything really. 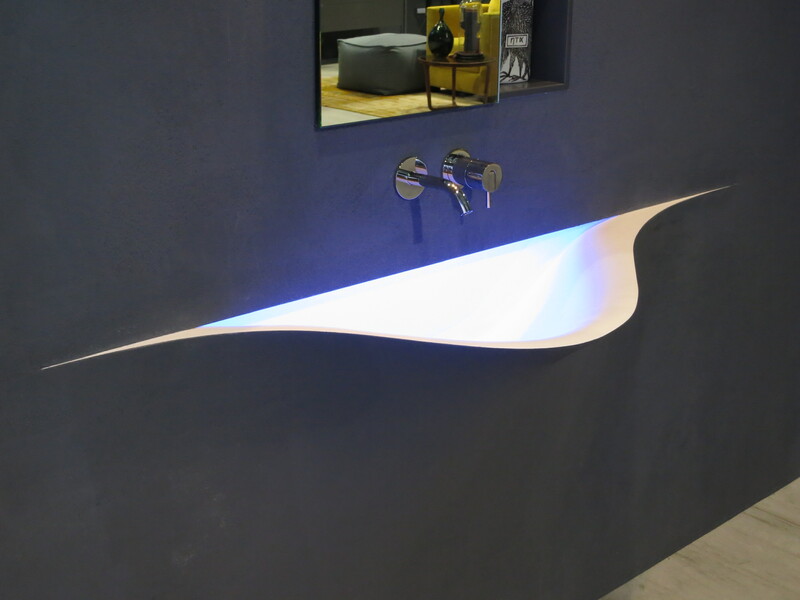 Next up is a variation on the curved/integrated wall basin idea from Antonio Lupi. 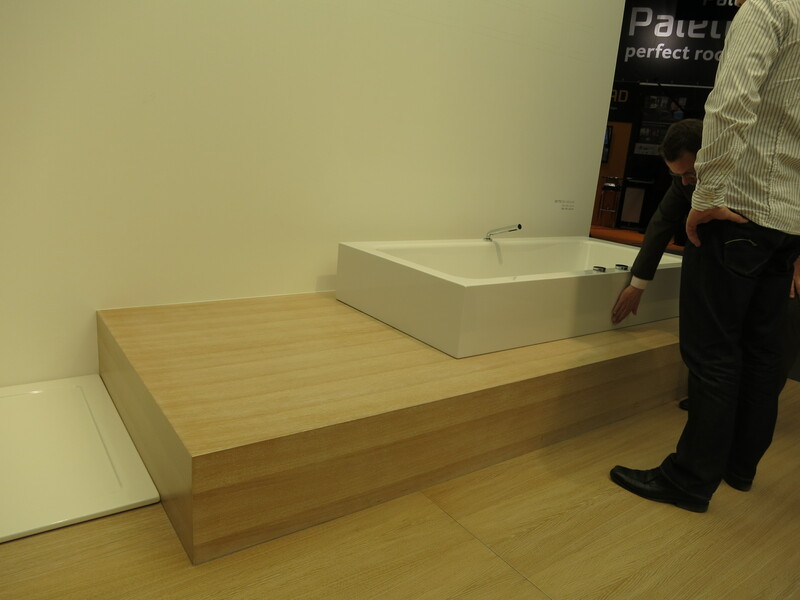 Last year they showed a basin that “peeled” away from the wall, from the top down. The face of the basin is then skimmed over with joint compound and painted to look as if the design was actually peeled away. It is lit with LED from above. I don’t like this much. It is too much of a one-line joke. 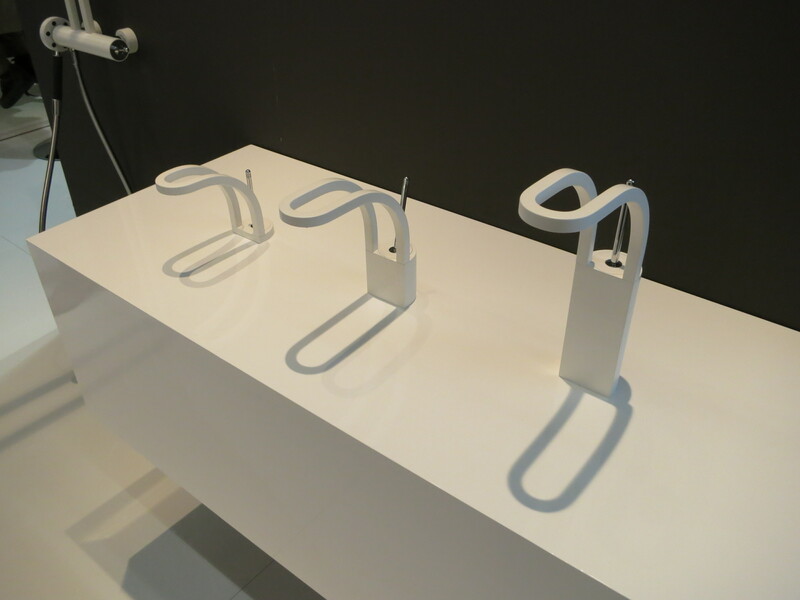 If you are walking around with those wet hands looking for your towelbar… well, I guess it is not functional enough for me. 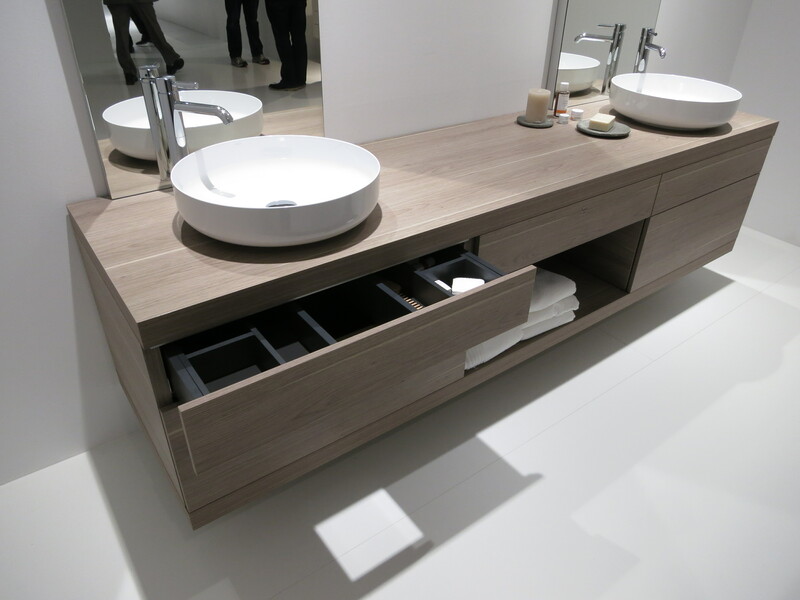 Domestic bathroom furniture should look as it works, not be a parlor trick. 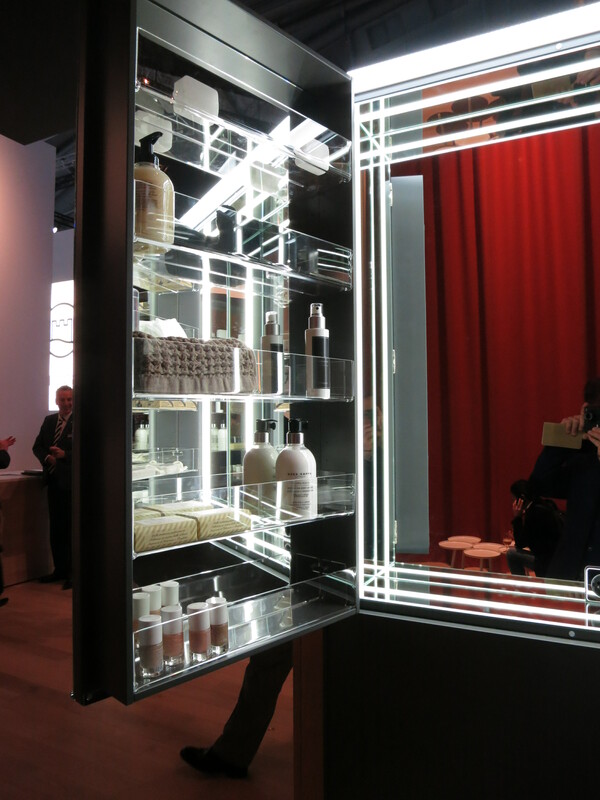 Next up: some mirrored cabinets from Keuco, the master of medicine cabinets. Nothing too innovative this year. In fact, there was not much innovation in general at this show. 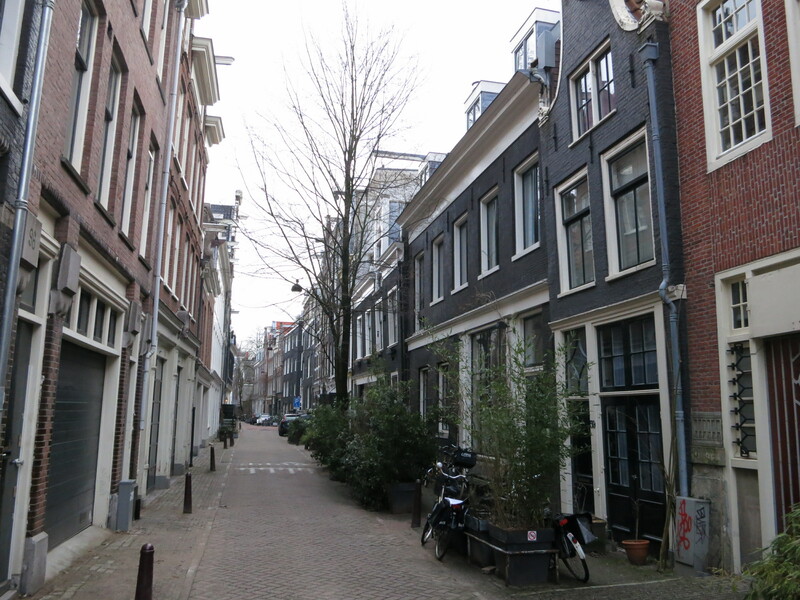 In years past there have been fabulous concepts of lifting doors, articulating features… my bet is that these cool ideas are very expensive to produce and this world economy is not supporting lavish designs at the moment. 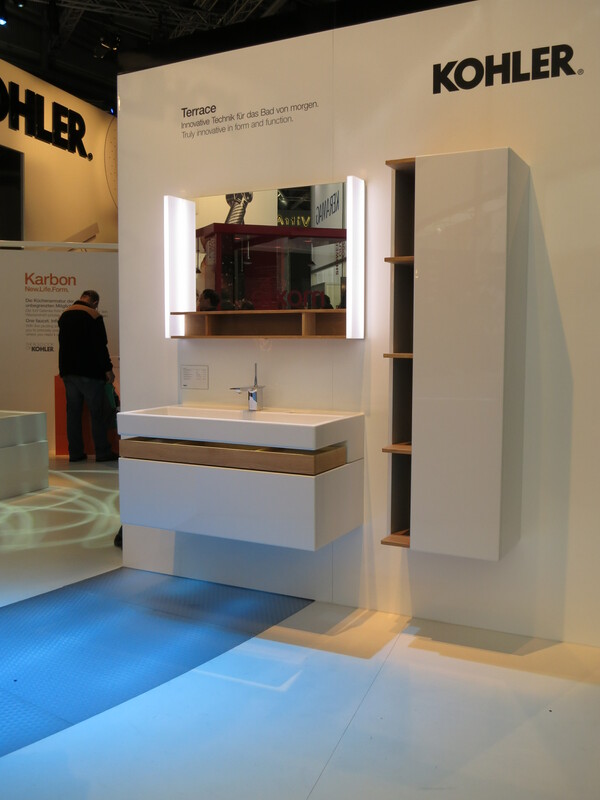 Here was one articulating design, with the mirror section and integrated light moving in concert. A mirrored cabinet. 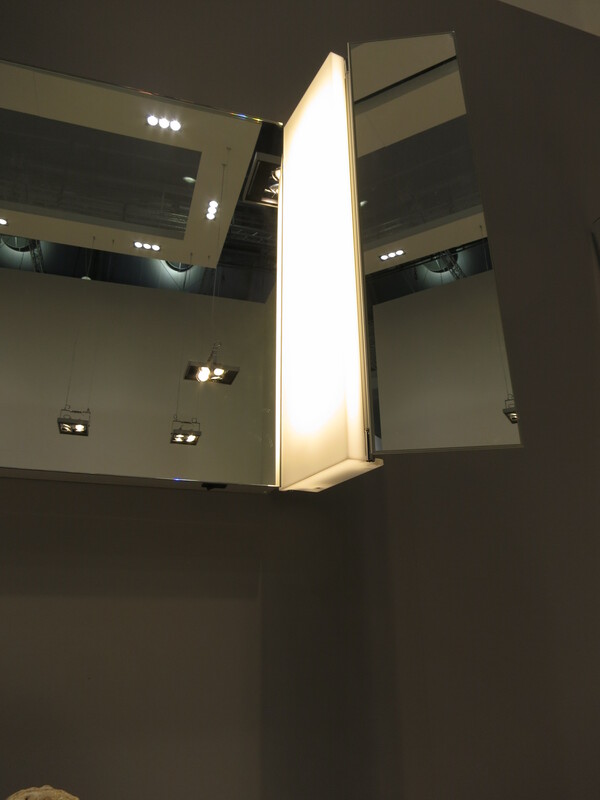 The big news from anybody doing mirrors was the way the lighting is integrated, something we worked very hard on at Robern. LED has made this much more elegant. 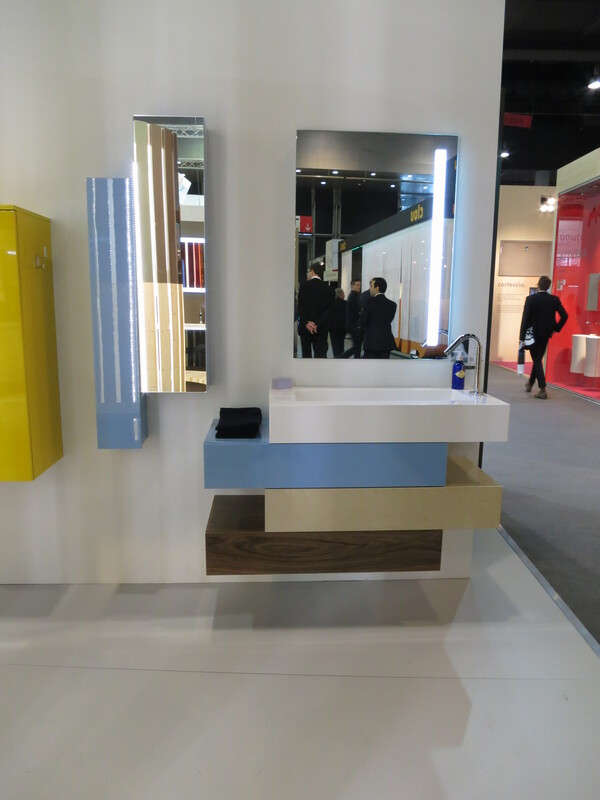 A mirrored cabinet from Burgbad. Very flashy and maybe a little too much so. All those highlighted acrylic edges were making my head hurt. Or was it the aforementioned jet-lag? This trip came with delays from every mode of transportation I used. The snow delay, normally awesome German trains were late on each occasion (which means missed connections, which could be disaster if you get on the wrong train), and the flights back were not without hiccup. Still worth the trip, however! 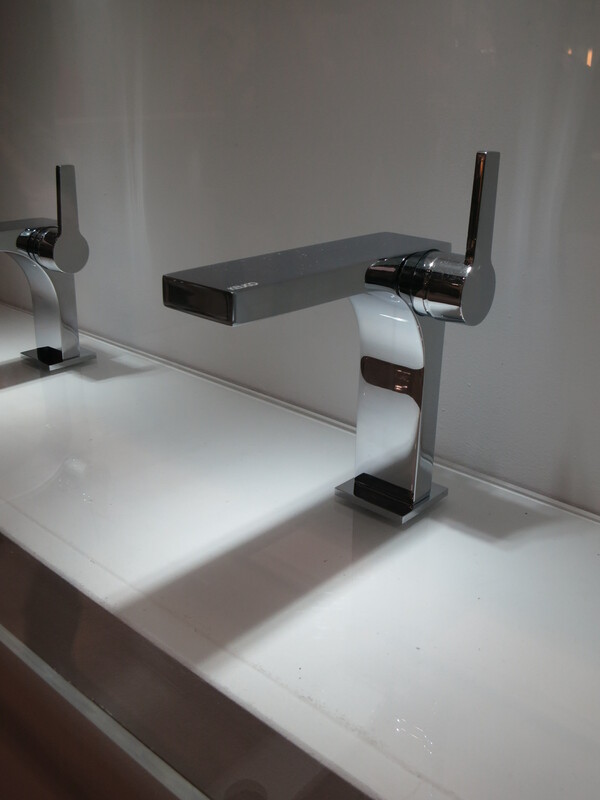 Next installment of ISH2013 I will cover faucets, lav fixtures and baths.